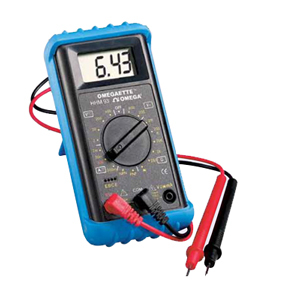 This a portable high performance low cost OMEGAETTE® Multimeter. Its specification range includes different models: while the HHM93 model is a multimiter/transistor test, the HHM97 and the HHM97EL models also feature a bargraph. A backlit display is also included in the HHM97EL model. All items provide accurate resistance and capacitance measurement. 참고: All units come with rubber boot, 9 V battery, test leads and operator’s manual.